The police have released important new details about their investigation into last week’s horrific Grenfell Tower fire that claimed the lives of at least 79 people. It comes as heartbreaking stories about the victims and survivors continue to surface, along with sustained efforts to raise money to assist all those affected, including a couple originally from Turkey. 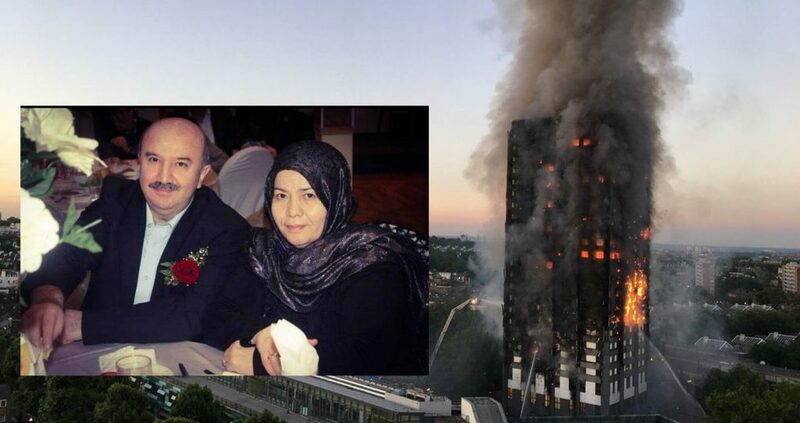 Grandad Şener Macit, aged 56, and his wife Hanife, 57, were among the last to make it out alive from the West London tower block in the early hours of Wednesday, 14 June. They had been stuck in their 16th floor flat, and had said their goodbyes to loved ones after being told that emergency services could not reach them. The couple, who were fasting for Ramazan, had been up for sahur (pre-dawn meal before daily fast starts) when they heard the fire engines arrive. Without any fire alarms or other distress signals in the building, they were initially unaware of the fire’s seriousness and assumed it was a minor incident. It wasn’t until a relative in a neighbouring tower block sent them a photograph of Grenfell Tower engulfed in flames that they realised the danger they were in. 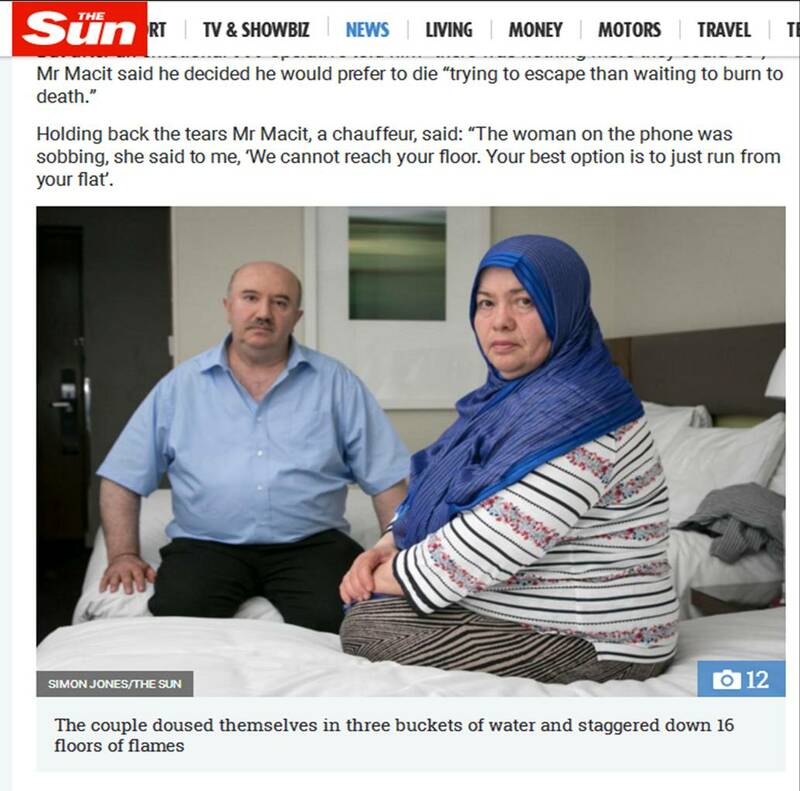 According to an interview the couple gave to The Sun a few days ago, Mr Macit immediately dialled 999 and was told to place wet towels under the doors and to stay put. Mr Macit said: “I was ringing 999 and at that point they were telling me someone would still be up to save us and to keep the line free because they would ring when they got here. The couple attempted to escape three times, but on each occasion they were forced back inside their home by hot, black smoke. Some time after 3am, they called 999 again, but a sobbing female operator told them, there was nothing more they could do. She said, “We cannot reach your floor. Your best option is to just run from your flat”. Neither Mr Macit, a chauffeur by profession, nor his wife, both in their fifties, were feeling physically capable of such a feat. But the choice facing them was stark: to stay and probably burn to death, or try to escape the burning building one final time via the stairs. The couple decided to go for it. They made an emotional last call to their children Merve, 27, and Tuğba, 24, asking for their forgiveness. The line went dead before they could speak any further, and the two daughters feared the worst. The couple took heed of earlier advice from the 999 operator and poured buckets of water over themselves, before placing wet towels on their heads, and headed down the hall to the fire escape. At around 4.30am the couple stumbled onto the ground floor, where fire fighters helped them away from the building. They were kept in hospital for three days, treated for shock and severe smoke inhalation. 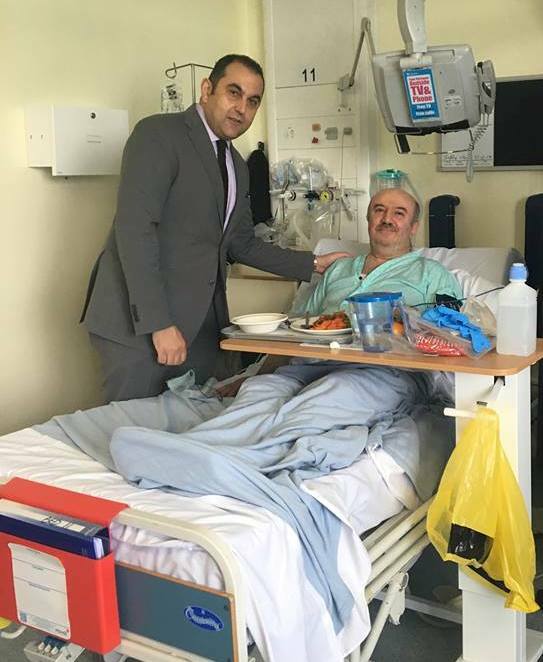 The couple were visited by the Turkish Consul General Çınar Ergin last Wednesday soon after their rescue, who checked after their wellbeing. The Macits have now been moved to a central London hotel where they are waiting to be permanently re-housed. The Macits, like all the other victims of the fire, lost all their worldly possessions. Their niece Kubra has launched a fundraising appeal for the homeless couple. 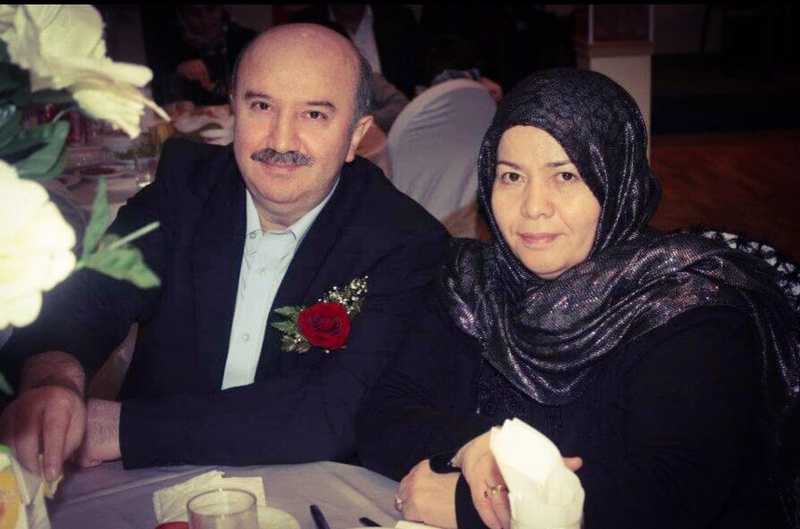 Those who wish to donate to the appeal to help Şener and Hanife Macit can do so here. For those wishing to contribute to a general fundraising pot set up for all Grenfell Tower victims can donate via the British Red Cross Grenfell Tower Appeal or the London Evening Standard Grenfell Tower Dispossessed Fund. A charity song, Bridge Over Troubled Water, by Artists for Grenfell has also been released for sale. Co-ordinated by Simon Cowell, the song features over 50 well-known artists and local people, with a grime star Stormy’s rap lyrics providing an emotionally-charged opening. The initial fire in Grenwell Tower – Britain’s worst since the Second World War – was an accident, caused by a faulty Hotpoint fridge on the fourth floor. The fridge fire occurred sometime between 12.30am and 1am. The first fire engines arrived within 10 minutes of the initial 999 call. Although the fire brigade was able to bring the blaze inside the flat under control, they were taken by surprise when flames combusted outside, rapidly spreading up and around the building’s exterior. With the fire spreading out of control, over 40 engines and 200 fire fighters were sent to help. Breaking every rule in their safety book, the fire fighters went into the building again and again trying to save its residents. Local people such as TJ Stylah , who streamed live on Facebook as he tried to comfort friends and relatives still inside the building, worked with the emergency services providing vital information to guide fire fighters towards those still trapped inside the block. Many complained about the smell of plastic and eyewitnesses captured the burning debris falling from the building’s exterior, which had been overwhelmed by flames, the towering inferno and smoke visible for miles. At 7.45am, the emergency services confirmed there were multiple fatalities. 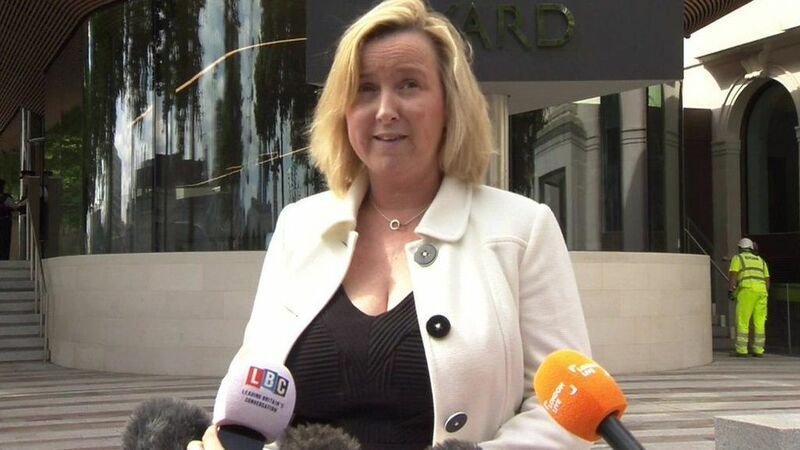 Fire Brigade Commissioner Dany Cotton (pictured below with Prime Minister Theresa May) described the Grenfell fire as an “unprecedented incident” on a scale unlike anything she had experienced in her 29-year career. Suspicion immediately fell on the cladding and insulation tiles used on the newly refurbished tower block. Police tests on the materials showed both to be highly flammable, with Grenfell’s insulation found to be “more flammable than the cladding”. The tests results were announced earlier today. Investigators led by Det Supt Fiona McCormack are now trying to ascertain if the cladding’s aluminium composite tiles and the insulation behind them were banned from use on these types of buildings. The North Kensington tower block is 24 storeys tall and contains 124 flats. It is widely feared that dozens more were killed inside the burning inferno than the figures the authorities have so far released. 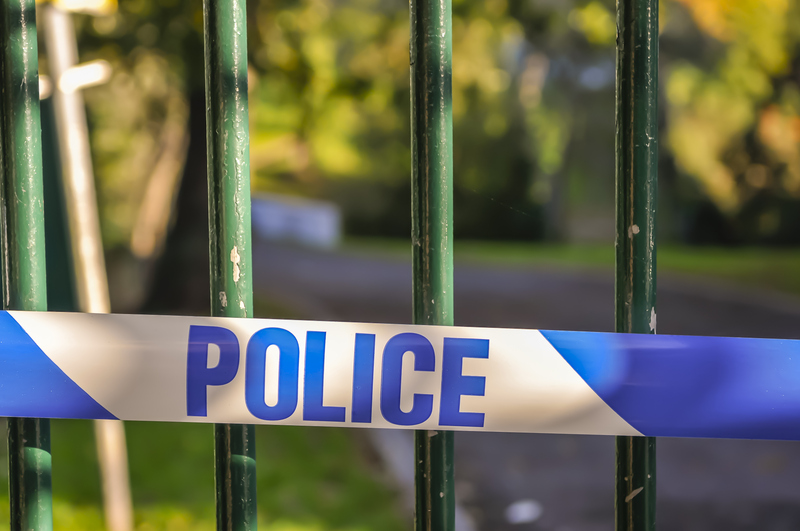 The forensic investigation inside the building continues and is expected to take months, but the police have already warned that the bodies of some of those killed are so badly charred that identification may be impossible. Local residents are continuing to suffer. The air turned toxic following the Grenfell Disaster, with fears huge levels of asbestos from the building were released after fire damaged walls and ceilings. The Grenfell Tower Action Group, which forewarned the catastrophe last November, posted yesterday about their concerns for the long-term health of those living near by. They also highlighted how residents in the neighbouring low level blocks, which relied on Grenfell Tower’s huge boiler room for their gas, have been left without heat and hot water for days. The authorities have seemingly forgotten about these victims too.